Meshabi, also known as Khushali is spoken in Malhori village of district Doda in Jammu and Kashmir. It has around 2000 speakers and belongs to Indo-Aryan language family. It is one of the endangered languages of J&K. 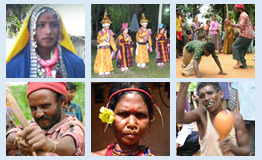 The members of this community comprise of both Muslims and Hindus. Majority of the population (almost 90%) is that of Hindus. Meshabi is especially the mother tongue of the Hindus (Rajpits and Harijans) of this area. The mother tongue of Muslims is Kashmiri but they are equally proficient in Meshabi. Hinduism is the dominant religion of this community. The main Gods worshipped are Lord Shiva and Durga Devi. In addition, there are two local Gods namely Naar Singh and Keelu Veer. They are considered spiritual beings who have served their community. The main occupation of this community is farming, although some people are laborers too. The women also engage themselves in working which includes packing of wooden boxes containing vegetables and other fruits. Malhori is approximately 20 km away from Doda. The total geographical area of Malhori is 11.6 km2 and 33% (3.83 km2) of the area is covered by forests. It is surrounded by five villages which are: Kulhotra, Sundhara, Kasaal, Bhidh and Raagi. The neighbouring languages are Siraji, Bhaderwahi, Dogri, Hindi and Urdu. Malhori is surrounded by Bhagwah tehsil towards north, Assar tehsil towards west, Dooda tehsil towards east, Chennai tehsil towards west. No work has been done on this language till now. There is nothing known about the classification, grammar and literature of Meshabi. It has no written script. Not even a single newspaper, magazine, article or book has been published in this language. It is not spoken anywhere in the world of media, neither television nor radio. There are no songs in this language. On various occasions like marriages, birth, etc. people sing songs in Bhadrwahi. Meshabi has no numeral system of its own. They use the numeral system of Hindi. Presently an attempt to document the trilingual dictionary, Grammar and Ethno linguistic report of the Meshabi language is undergoing.